Travis Benjamin was leading around the two-thirds mark of the Riverside race. Mike Rowe was second. Both drivers were behind the soon-to-be lapped #14 of Rick Martin on the backstretch when Rowe made contact with Benjamin’s #17, which then went spinning. Benjamin went to the back because of the spin and had further mechanical problems that kept him from finishing. Rowe was sent to the back for his role in the incident and came back to finish second. As far as opinions of the incident go, there are far too many of those being tossed around after the race and on message boards this week to print here. But the bottom line is this – Benjamin was mad after the race and Rowe showed plenty of remorse for what happened. The role that the lapped car played is up for debate as well. If the incident hadn’t have happened and the two drivers had finished first and second, both guys would have been in much better spirits after the race. With five laps to go, the field returned from a caution period with Johnny Clark on point. The starter did not like the jump that Clark made and did not throw the green flag. That caused all kinds of problems when the field stacked up in a big logjam on the backstretch. 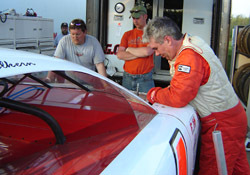 Before that final wreck, Scott Mulkern was almost assured of a top five finish. But getting slammed around with five to go, having to pit to repair damage and still having the car wounded doesn’t make fore a good few final laps. Rowe told Speed51.com that he’s going to do what he can to keep the peace with Benjamin. And even though there were heated words between the two camps after the race, Rowe understands exactly where Benjamin and his team are coming from. The biggest shame of the Benjamin vs. Rowe incident was that it pretty much ended a great run by one of the nicest guys with the worst luck in New England racing. Travis Benjamin has been quick in many events going back through last season, but when it comes to having the luck to get a top finish, he hasn’t been able to seal the deal quite yet. Others weren’t so lucky. Ben Rowe, Scott Mulkern, Donnie Whitten, Donnie Lashua and Corey Williams were among the drivers who got caught up in the melee. On the other side of the coin, there were plenty of teams that did play nice with each other on Saturday. Corey Williams took a head first drive into the frontstretch wall during his heat race and at first glance, it looked like his #47 car might be finished for the night. But that was far from the end of the story. After his car was towed back to the pit area, several teams walked over to Williams’ pits. 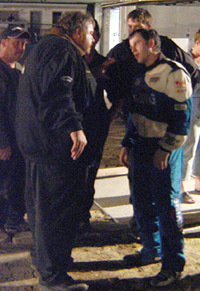 Gary Smith came over to talk with the young driver. 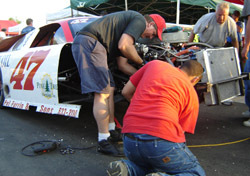 Mike Rowe’s team offered parts to get the car fixed up and Michael Ruttkamp’s team got right in there to help fix the car. With that help, Williams not only was able to get ready for the feature, but he was able to go on and finish the 150 lapper in the 10th position. The help from the other teams really made the difference according to Williams. The first one was of his own doing, but it didn’t really hurt his run. It actually might have helped him focus a little bit more later in the race. “As we got going, the car kept getting tighter and tighter and we finally figured that there must have been a tire going down because it got so bad. It turns out that both right side tires were going down." Cassius Clark had one of the fastest cars at Riverside and was never far from the lead in the early going. But late in the race, he had to pit his #8 car and drop to the back after a strange tire problem surfaced. Clark went on to finish sixth, but wasn’t partially thrilled about it. Mulkern did end up in the top 10, but it wasn’t something he was happy about when he climbed out of his car. Clark came into the race second in points and now shares that position with his close, but unrelated friend with the same name - Johnny Clark. But even as he sits just a few markers out of the point lead, Cassius Clark isn’t thinking anything about a possible championship at all. Donnie Whitten is easily one of the names that keeps coming up when talking about who has improved the most in 2005. 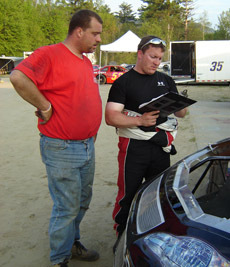 The Maine schoolteacher finished fourth at Canaan last week and was right up in the top five again at Riverside before running into a few problems. With 10 laps to go, Ben Rowe was leading. In those final ten circuits, he slid through some oil and lost the lead and then he got turned around on the backstretch during the infamous late restart. Rowe ended up with the third place trophy instead of the winner’s check, but he wasn’t down about that at all. “I’m pretty happy actually, the boys worked their asses off today in the heat and that’s the best that we’ve run here. We really didn’t have a car to win. We had a second or third place car and that’s where we ended up. 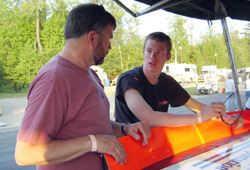 Lapped cars and late race fireworks hurt many driver when it came to getting a top finish, but those two factors actually helped Johnny Clark when it came to being able to win the race. Clark also won last year’s race at Riverside and compared the action in the two events. Mike Rowe was one of those guys that had big problems with the lapped cars. Rowe lost a lot of time early on when the #02 of Eric Hudson was in his way. Eventually, Rowe got by and even though he didn’t want to point fingers after the race, he remembered the trouble that he had. Rowe was dominating the PASS opener at White Mountain earlier this season when a lapped car turned him around and cost him the lead. That incident was fresh in his mind at Riverside. 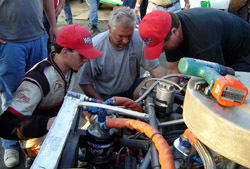 The PASS Modifieds played a supporting role in the racing card at Riverside. Chris Staples kept ahead of defending champion Mark Lucas to win the Modified feature after starting from the pole. Katie Hagar and Wayne Allard were also contenders in the event, but tangled past halfway. Allard’s #15 went over the left front of Hagars’ car and both received enough damage to retire early from the race.